avalanche airbag backpack looks like deployed. Airbags have saved countless lives in automobile accidents. Who knew an airbag could save a life in an avalanche? But that's what happened to Jeff Wyshynski while skiing in Alaska. 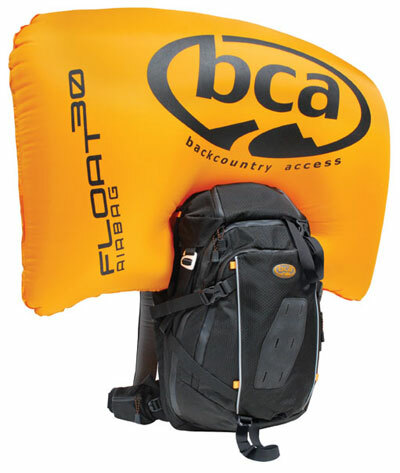 He was wearing a Backcountry Access Float 30 avalanche airbag backpack, which he deployed when caught in an avalanche. As you can see, Wyshynski wound up on top of the snow, which is where you want to end up after all the rushing snow has stopped moving. It's what the Float 30 is designed to facilitate. According to The Outside Blog, the airbag backpack has been tested with much success in Europe. Such news is very encouraging. Though we don't know how big this avalanche was in Alaska, it does offer a great example of how the airbag works. The airbag itself not only helps prevent burial, but protects the head, neck and upper body from trauma. With its location behind the head and away from the hips and arms, it preserves the user’s peripheral vision and his or her ability to escape the avalanche before it picks up speed. The airbag pack sells for $700. Worth every penny if you're ever caught in an avalanche. A Cell-phone tracking device available for skiers, snowboarders and the general public!